“He [Gadahn] took it very seriously. He got into the music and studied it as well as he could,” says a death metal DJ using the pseudonym Spinoza Ray Prozak to The New Yorker. 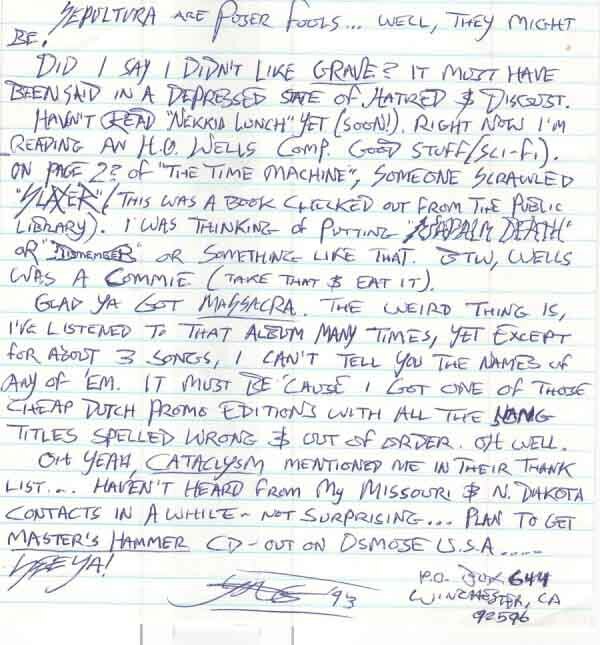 Prozak describes the death metal subculture as an extremist movement. “We are people dissatisfied in modern society. We believe we are on a journey towards death, doom, destruction, horror,” he says. Extreme music attracts extreme people. Those take several forms, with the honest ones being attracted to it because they believe none of the solutions that society will consider are viable responses to the problems at hand. What appears to be rejection of society is in fact rejection of social control over what can be done to solve the problem. Just like Josef Stalin did some things right, al-Qaeda undoubtedly has legitimate criticism in with their other attributes, which not being a religious scholar I do not fully understand. They hate fast food, urban blight, mass culture pop music, cheesy movies, lying politicians and a society withour culture or honor too. That makes them very compatible with death metal but more in line with black metal. Thanks to Antti Boman and Devamitra for the notice and translation. 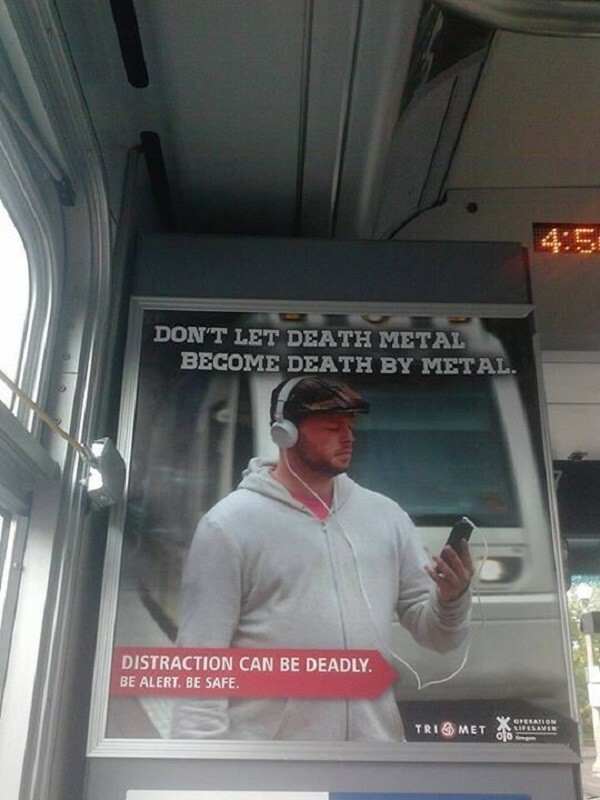 Oregon transportation authority Tri-Met is running a series of ads on billboards and posters warning people against the problems of distracted pedestrians, especially those lost deeply in their MP3 players. The campaign includes the above amusing reference to death metal, “Don’t let death metal become death by metal,” although both sound pretty cool to us. This is not Tri-Met’s first mention of death metal in its public campaigns. It also shows up in writings about riders. If anything, this suggests the Tri-Met people are at least aware enough of death metal to deserve more of it in their lives. Lady on my bus wearing cute pollyanna dress, white rights, black penny loafers and blasting what sounds like death metal. Longstanding US speed metal/death metal band Deceased has completed work on its upcoming two-disc album of covers, Cadaver Traditions, which will be coming out on Hells Headbangers Records this summer. Cadaver Traditions will include 53 tracks in total, with two of those being brand-new recently written Deceased songs which had previously been released on vinyl. Judging from the wide range of influences on this disc, it will not only be fun for Deceased fans but for metal historians looking for the roots of early death metal. 53 tracks in all 2 cd set… look for it this summer on hells headbagers ‘cadaver traditions’. cover song mania and the 2 newest deceased songs finally on cd. up til now it was only vinyl. 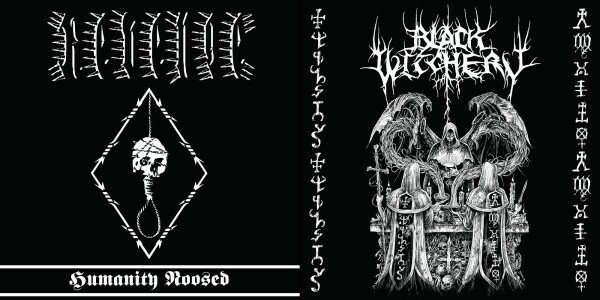 In 1998, a few black metal musicians — many of whom faced legal troubles in their home countries — came together to make a recording. 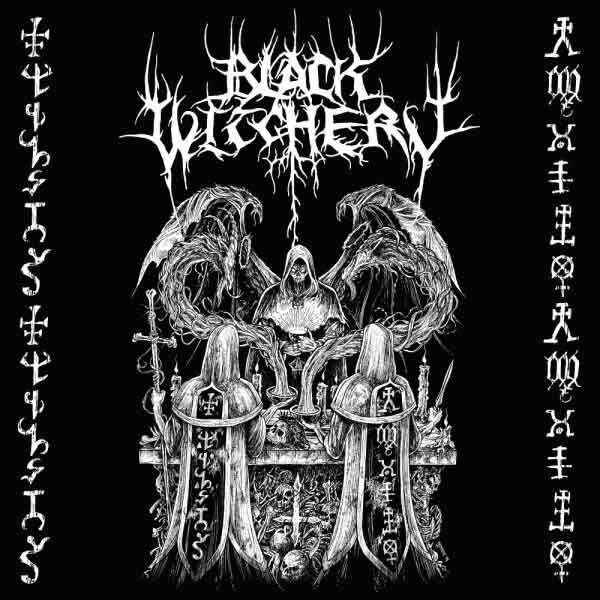 The result, Asgardsrei, captured black metal in transition: its epic past, its roots in punk merged with Oi, and its tackling of unpopular subject matter, in this case out-of-the-closet NSBM. Absurd back in the day combined a poetic style that might be called “immaturism,” a wide-ranging complaint with the modern world, and yes, some rather violent ideas. It defied categorization. Their debut album, Facta Loquuntur, sounded at times like ultra-simplistic punk with lyrics from a child’s point of view, pointing out not policy failures or physical breakdown in Western society, but its completely backward spirit and denial of all existential importance. 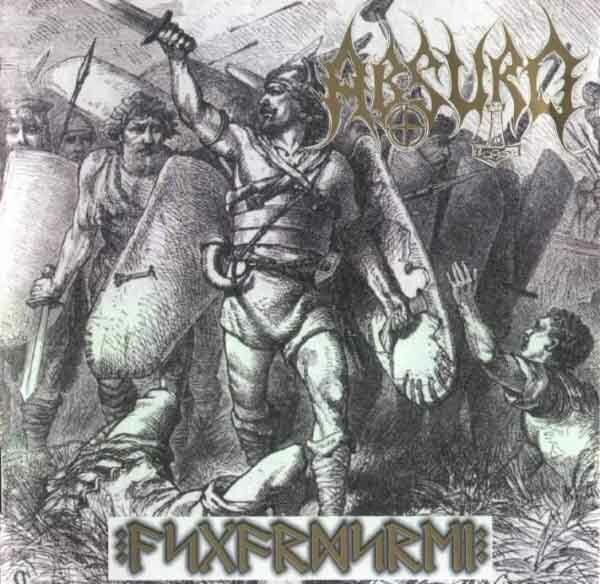 Always on the edge of black metal, Absurd both increased the discernible Oi/RAC influence and put together more black metal style riffing, creating a hybrid that kept both voices without allowing the extremes of either to take over. Fast-forward to 2012. Absurd — now with none of the 1999 members — re-issues Asgardsrei in a new form. As it is arguably the most musically interesting album from Absurd, combining the raw forest metal (this is the band that wrote “Green Heart” after all) with greater proficiency and alertness, it could be a big seller for this band. Unfortunately, they decided to under guise of a re-master actually alter this album. First they turned up the guitars and turned down keyboards, background sounds, etc. They replaced the subtle intro with patriotic bluster and industrial percussion. Then they either modified or added drums to give the album a constant kick-happy Oi beat. Finally, they modified vocals to sound more like the recent Oi/metal hybrid the band has been putting out. The result crushed all subtlety and made this album very much the exact thing this band in its original form would have recoiled at. Evil in the forest in Germany’s Green Heart ! Remember those who never had a chance. Like many of us, they grew up in a wasteland of broken families, pointless wage-slave jobs, hippie ideals and grim social collapse mundanities, a utopia of fond visions and a dystopia of nightmarish collisions with the reality those denied. They had nothing to look forward to but a mortgage in the burbs, a family ending in divorce, and a society which systematically disregards the beautiful and zeroes in on the failed, the corrupt and the deceptive. A world coated in advertising and saturated with deceit. Officials also announced that a separate strike killed Adam Gadahn, an American who became a prominent propagandist for al Qaeda, was close to Osama bin Laden, and had a $1 million bounty on his head. The deaths bring to seven the number of Americans killed in drone strikes, six of them inadvertently. The White House said it was unaware the four were present at the sites, which were hit on Jan. 14 and Jan. 19 near the border of Pakistan and Afghanistan. President Barack Obama apologized to the families of the hostages and said he took full responsibility as commander in chief. This conflict is beyond politics. 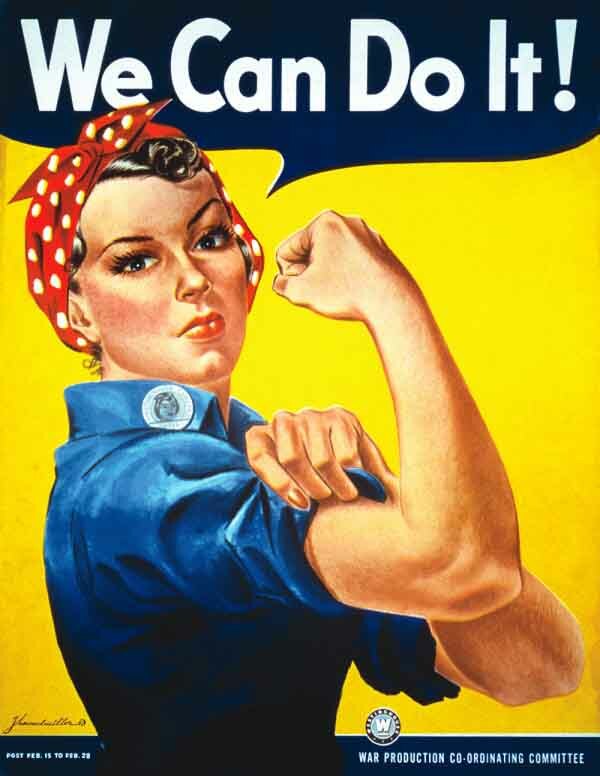 Yes, we have divided into factions but no, that is not our problem. Our problem rebirths itself time and again because it is within. We have become rotten, whores to our own independence and manipulators so canny we have even fooled ourselves. This civilization has sold itself snake oil for centuries and the result is the continual destruction of those with spirit, sensitivity and the guts to do something about it. Those who conform, lower standards and follow trends always win. This is the source of evil the real thing, as opposed to the supernatural scapegoat that the credulous choose to believe exists. Above you can see a letter written by Gadahn back in the day. It contains some of his opinions on death metal and literature. He had great taste in metal, came from a broken home in a broken time, and did his best. Rest in peace, Adam. 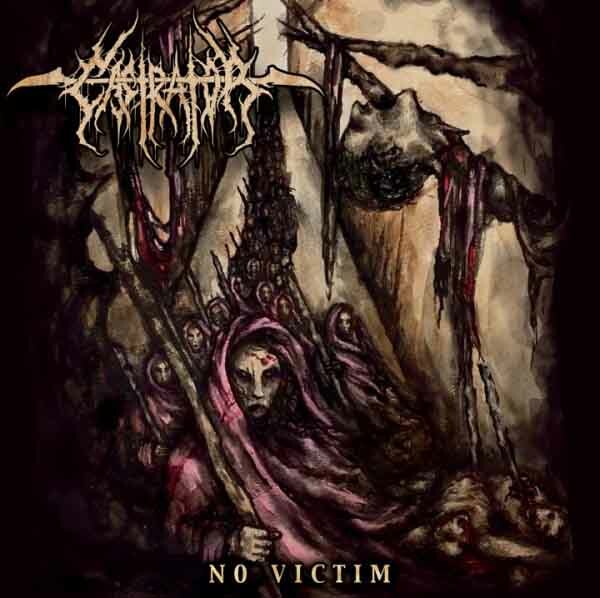 Approaching deathcore like a doom metal band, Castrator mix invariant riff-chorus pairs with extended solos over slower riffing and hybridize the chromatic riffing of their influences with Judas Priest style hard rock riffs. The strength is the melodic soloing which, while very much cut from a conventional metal/rock mold, guides the slowly looping slow-paced riffs to make an interesting atmospheric piece. Their death metal riffs however both conform strictly to archetypes and achieve no variance, so that a wall of extremely similar sound gives way to a solo, then repeats briefly and fades away. Many of these riffs stick to fixed patterns at a single note, which produces the kind of droning that made post-Suffocation clones excruciating. Melodic hooks drape over power chords in a backdoor way of creating a groove, but these become repetitive quickly as well and have the kind of pop tendencies that trivialize death metal. The vocals perhaps provide the strongest point of focus for this band, but that in turn becomes a weakness, because vocals alone cannot unite a loop of similar verse/chorus riffs with breakdowns into a song. The gruff monotone vocals keep a bass-heavy pulse going that drives songs forward with aggression and anger. While the band write catchy songs, the low internal complexity and archetypal riffing detract from the desire to hear this again. What is a novelty band? A band chosen for anything other than its music. Common topics include bands with: women, female singers, minorities, retarded people, gay people, transsexuals, unusual instruments, drug use, JPOP girls and children. Record companies love novelty bands because the media fawns all over them, then the hipsters do, and it sells hype quickly and bypasses the normal metal fans, who are critical of quality instead of being driven by novelty. The latest novelty comes to us from Vice Magazine who want us to read about Al-Namrood from Saudi Arabia. While it is true that this band may be risking their lives to perform, it seems like they face roughly the same amount of struggle that bands behind the Iron Curtain did back in the 1980s, which means they can circumnavigate authorities to exist, record an album, shoot a video, and be feautured in American media with their faces in the video and not get killed. As with all novelty stories, this will be short-lived. 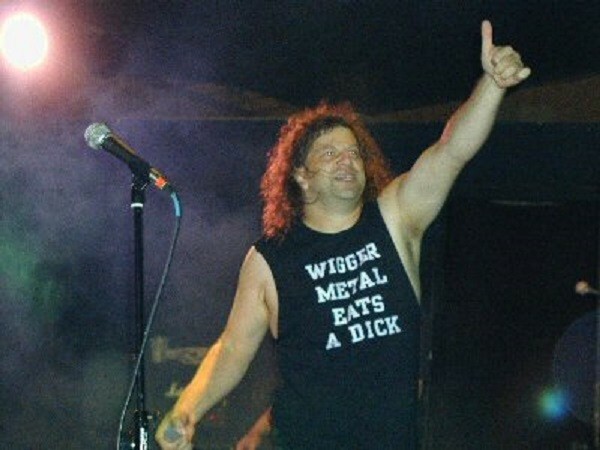 There have been many tales of heavy metal bands from the Middle East and after the media blitz, these bands have gone nowhere. The quality test is what matters. If you cannot pass the quality test, you are SOL. Al-Namrood will be the latest to fail the quality test because their output is only nominally black metal, not aesthetically distinctive and indeed a bit awkward, and finally, the songwriting is not that memorable at least by metal standards. “Bat Al Tha ar Nar Muheja” consists of fast melodic riffing in the style of Satyricon Nemesis Divina with a Middle Eastern influence on the choices of scales used. The vocals, on the other hand, sound like something from more recent Absurd albums. The song seems put together in the style favored by Behemoth, where riffs relate marginally to each other and the main point is to follow the vocals and rhythms to a big break and a melodic interlude, after which point the band returns to blasting fast single-picked riffs. While it is not terrible, it is also not exceptional. The MetalGate Band group produces a series of podcasts where informed participants in the movement against censorship in music meet to talk about issues of the day. If your Mom is in the room (for modern metal fans) or your children are (for underground metal stalwarts) you might want to keep the mute button handy because there is frequent, copious and gleeful use of obscenities. Every episode has its own topic, and some high points which may be related. The peak of this episode seems to be the discussion about the difference between making media solely to make money or be popular, and those who want to be popular as a means of getting their music or movies out there to express an idea.